ALFRED, Maine (AP) — A woman with a history of drunken driving convictions drove her car onto a baseball field in Maine during a game, striking and killing a Vietnam War veteran who confessed five years ago to killing a 4-year-old girl in an alcohol-fueled 1968 hit-and-run, police said. Screaming bystanders and ballplayers fled as Carol Sharrow, of Sanford, drove through a gate onto the field Friday night, police said. Video shows the car driving around the infield, turning over home plate and then heading toward the stands behind third base. Douglas Parkhurst, of West Newfield, was near the park's main gate before he was hit and the car sped away. A witness said the man whose grandson played on the team was trying to push children out of the way. "It was awful," said Sanford resident, Karyn Bean, who said she saw Parkhurst get hit. "A car driving through the gate hitting a man who was pushing kids out of the way, then her driving up the road easily doing 50 to 60 miles per hour past us ... It felt awful because we couldn't do anything." Parkhurst died on the way to the hospital, and no one else was hurt. Tim Curley, a coach, said he was standing in the third-base dugout as he heard squealing tires and watched a car crash through the gate after its driver yelled, "Open the gates!" Curley later recognized that the driver was Sharrow, who worked as his grandmother's caretaker 12 years ago. "I felt kind of helpless because at that point the only thing I knew was I cared about the safety of the kids on the ball field," Curley said. "I immediately yelled: 'Get off the field!'" 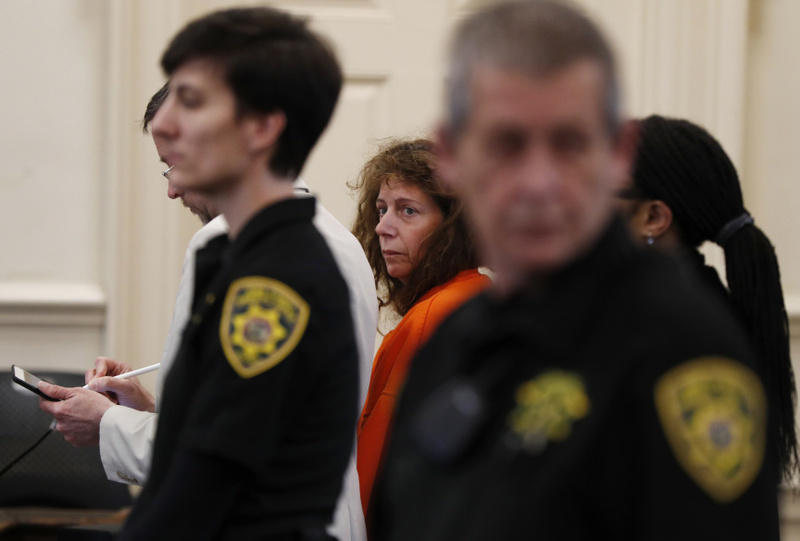 Sharrow did not speak or enter a plea during her first court appearance in Alfred on Monday. She was held on $500,000 bail and the court also ordered a mental health evaluation. Sharrow's attorney, Robert Ruffner of Portland, declined to comment on a possible motive. He also said that he has been given no indication that alcohol was involved, and does not know if Sharrow and Parkhurst knew each other. Sharrow has two previous drunken driving convictions in Maine and New Hampshire, according to Sanford police Det. Sgt. Matthew Jones. Authorities have declined to say whether alcohol was involved on Friday. She faces up to 30 years in jail. Parkhurst was never charged in the hit-and-run death that killed Carolee Ashby in New York on Halloween night in 1968. The statute of limitations had long run out when Parkhurst walked into a police station in 2013 and confessed after two interviews with investigators. In his four-page confession obtained by the Syracuse Post-Standard, Parkhurst said he and his brother had been drinking before he hit the girl. He said his brother was passed out in the back seat. "While I drove through the city of Fulton, I heard a thud," Parkhurst wrote in his confession, in which he estimated he had around three beers. "It sounded like I hit a dog. I don't know where I hit that thing...."
Parkhurst said he didn't see what he hit, and did not stop. He didn't remember hitting the brakes. "I don't remember seeing any kids but I believe in my heart I hit the little Ashby girl with my car," he wrote. Parkhurst told police on the night of the hit-and-run that he hit a guard post, but admitted in the confession that was a lie. "That did not happen, but I don't know why the police never challenged me on this," he wrote. "I wish they did and I would have told them the truth." Darlene Ashby McCann, who was holding her little sister's hand when she was struck, said that Parkhurst never apologized. She said that his being fatally struck "made a complete circle. Now it is time to move on." "I know my mom would have been grateful that children were saved," McCann told the Portland Press Herald. "Sometime I may be able to forgive him, but not right now."